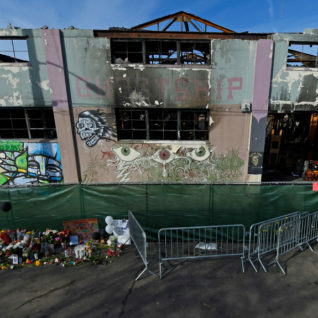 Two CCC grads were integral to a recent Pulitzer Prize win for Breaking News by the East Bay Times for their outstanding coverage of the Ghost Ship fire tragedy. Craig Lazzeretti, the East Bay Times metro editor, lead the coverage that began around 4:00 a.m. on December 3, and continued for two full weeks. He also had a hand in editing the stories and photography. He directed a group of seven reporters and at least three photographers for continuous through online, print and social media formats. Craig is a Pinole Valley High School grad (1988) who was an Advocate associate editor from 1988-90. He graduated from SF State in 1993. David DeBolt, an East Bay Times reporter (and son of CCC Journalism Department Chair, Paul DeBolt), had at least five by-lines among the articles entered for the Prize. He also had a hand in updating dozens of online articles and posting hundreds of social media links and messages. Like all the core reporters on the coverage team, he worked 14-16 hour days for more than two weeks. David is a Will C. Wood grad (2003) who was Advocate Editor-in-Chief from 2005-06, and a staffer from 2003-06, also serving as sports and news editor. He has an A.A. in journalism from CCC (2006) and his bachelor’s in journalism from SF State in 2008. CCC’s other Pulitzer Prize winner is Michael S. Williamson, a 1975 graduate of Pinole Valley High School. He was an Advocate staff photographer 1976-77. He has worked for metro newspapers and been a freelancer during his career, but he is currently a photographer for the Washington Post. He won a Pulitzer in 1990 for General Non-Fiction (he took the photos) and another in Feature Photography in 2000. He was one of three finalists for a Pulitzer in Feature Photography in 2014.